Janet Yellen and Julia Gillard should get together. Ms Gillard, who served as Prime Minister of Australia from 2010 to 2013, would have timely advice for Dr Yellen, who will take over as the head of the US Federal Reserve next week. 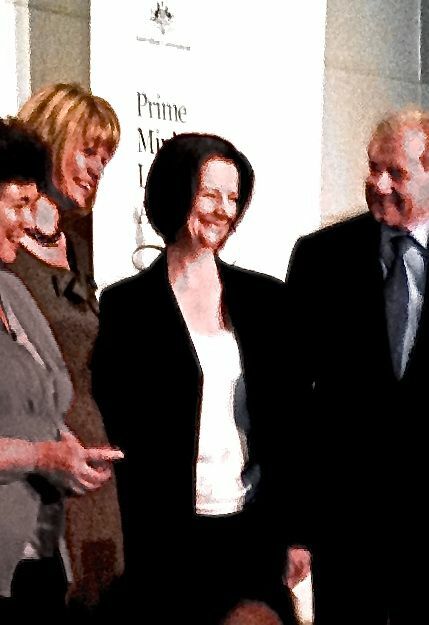 Gillard was subject to a campaign of unrelenting gender-related criticism and attacks from a large swathe of the media. She handled it, but she is a career politician. Dr Yellen is not a career politician, but she is about to step into a role that is intensely politicised [1, 2, 3]. The chair of the Federal Reserve is the object of non-stop scrutiny, the subject of countless opinion pieces. Yellen has already been called “the most powerful woman in the world,” and “the most powerful woman in US history.” The role of Federal Reserve Chair creates winners and losers – meaning it creates friends and enemies. The stage is set for a battle that will, one way or another, involve gender. And the most vocal stakeholders in the Fed’s decisions are the wolves of Wall Street. Not people used to having a woman for a boss. According to the 2013 Catalyst Census: Fortune 500 Women Executive Officers and Top Earners, which counts the number of women in upper management in Fortune 500 companies, women are 17.6% of executive officers in the finance and insurance industries. Source. Wall Street’s preferred candidate for Fed chair was Larry Summers, a former Treasury Chair who has argued women are genetically inferior at science. He missed out on the top job in favour of the lady. Yellen’s job is going to be difficult and controversial. She will not only have to answer for her own mistakes, she will have to answer for those of Bernanke too, since she backed his policies. It is difficult not to make mistakes as Fed Chair. Bernanke and Greenspan both made screw-ups in relation to easy money, house prices and the GFC. The stage is set for a great big gender battle. So, what can Gillard tell Yellen? Gillard was perfectly technically qualified to take the role. She had been a very capable Minister in the Education portfolio, and also a stand-out performer in Parliament. 2. Expect attention on extraneous details. Julia Gillard’s glasses. Julia Gillard’s bum. Julia Gilard’s absent handbags. Julia Gillard’s jackets. Julia Gillard’s house. Julia Gillard’s earlobes. Julia Gillard’s fruitbowl. Dr Yellen will find many aspects of her life are now public property. “The 67-year-old was dressed in the same black suit she wore a month earlier when President Barack Obama announced her nomination, enough for her to be targeted by bloggers Warren Rojas of Roll Call and Patrick Tutwiler of FishbowlDC. It’s not just clothes, partners matter too. While Gillard’s partner was a former hairdresser, Yellen’s partner is a former Nobel Prize winning economist. Nevertheless, Time Magazine is apparently obsessd with Dr Yellen’s homelife. The fact that these women’s partners matter suggests something is different about their tenure. Who even knows what Mrs Bernanke does? When Australia’s first female Prime Minister was criticised for having a “big arse,” it came from trailblazing feminist icon Germaine Greer. Australia’s first female Prime Minister was also the only one to enjoy, while still in office, a satirical comedy about her homelife, including bedroom scenes, featuring left-leaning comedians and run on the national broadcaster. Dr Yellen can probably count herself lucky if she only shows up on SNL. 4. Stand ready to be accused of playing the gender card when you defend yourself. An ugly gender war could easily happen even though WSJ and Bloomberg will be sure not to print anything directly criticising Dr Yellen over her gender. That sort of criticism of Yellen will start in the blogs. Yellen will be asked about it. Her reaction will be immaterial. The mainstream media will feud over what the correct reaction is. Is she getting distracted? Is she missing a chance to make social change? Is she giving the issue air to try to draw attention from her failings? Is she refusing to make a comment that would put the argument to rest, to try to draw attention from her failings? 5. Blaze a trail, take the heat, and leave a better world behind. Julia Gillard’ prime ministership taught millions of Australians the meaning of the word misogyny, put gender issues on the front page week after week, and lifted awareness of the many insidious ways in which discrimination can occur. But the process is not a happy one. It is bitter. In Australia, Ms Gillard was replaced by Tony Abbott, whose views on gender are, shall we say, unreformed. And the damage of a rolling multi-year debate about the role of gender in American business and public life could even be enough cruel the chances of one Hillary Clinton. The better world may take some time to come about. Interesting parallel and a depressing reminder of how far there is still to go. The world is for the most part still run by old men lacking insight, awareness and empathy but capable of awe inspiring self pity – demonstrated most recently by Tom Perkins. I wonder if history will treat Julia Gillard better? Bizzarely, the WSJ goes on to defend him a few days later!